Amid the ashes of Nazi Germany’s defeat, Marianne von Lingenfels returns to the once grand castle of her husband’s ancestors, an imposing stone fortress now fallen into ruin following years of war. 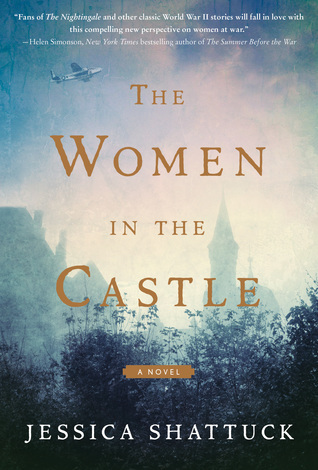 The widow of a resistor murdered in the failed July, 20, 1944, plot to assassinate Adolf Hitler, Marianne plans to uphold the promise she made to her husband’s brave conspirators: to find and protect their wives, her fellow resistance widows. First, Marianne rescues six-year-old Martin, the son of her dearest childhood friend, from a Nazi reeducation home. Together, they make their way across the smoldering wreckage of their homeland to Berlin, where Martin’s mother, the beautiful and naïve Benita, has fallen into the hands of occupying Red Army soldiers. Then she locates Ania, another resistor’s wife, and her two boys, now refugees languishing in one of the many camps that house the millions displaced by the war. Review: After WWII, Marianne returns to her family castle and upholds a promise to her late husband, who was executed as a conspirator: she will find the widows of other conspirators and try to protect them. Marianne is a force of nature. She sets a goal and then goes out to achieve it. She is strong willed, principled and tenacious. She locates Martin, the son of her childhood best friend, and then locates her friend's widow, Benita. She then finds Ania, another wife and her two sons. They live together trying to rebuild and face trials and tribulations along the way. This was a very interesting read. I've read a lot of WWII books and this was a different perspective. Fans of WWII fiction should give this one a try.